Acer today expanded its convertible notebook offerings with the Spin 7, Spin 5, Spin 3 and Spin 1. 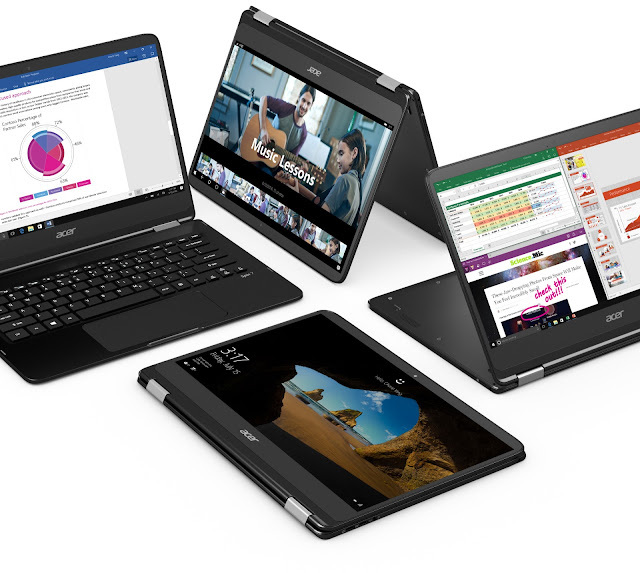 The new Spin series convertible notebooks run on Windows 10, and incorporate innovative 360-degree hinges, along with Continuum, that enable them to be used in various ways: as a notebook or tablet, in a space-saving display mode, or in tent mode for sharing presentations or watching movies. Providing the ultimate in flexibility, they make computing anywhere, anytime easier than ever. The Acer Spin series offers a wide variety of choices to address different needs, with the Spin 7 debuting as the premiere line. The Spin 5 and Spin 3 offer solid performance combined with compelling technologies such as Full HD IPS displays and speedy solid state drives, while the Spin 1 is ideal for students or as a second computer. Depending on model, they offer fast and reliable wireless connectivity with 802.11ac MU-MIMO wireless technology, providing up to 3 times faster downloads. They also feature Acer BluelightShield which minimizes eye strain, Acer Color Intelligence which maximizes color saturation for bright and clear visuals, and Acer TrueHarmony for crisp and clear audio. Thinner than a standard DVD case, the Spin 7 is a mere 0.43 inches thin (10.98 mm) and weighs just 2.6 pounds (1.2 kgs), providing extreme portability and flexibility. Its 13-inch all-aluminum uni-body houses a 14-inch Full HD IPS Corning® Gorilla® Glass touchscreen display with a narrow bezel. Sleek and contemporary, its matte black chassis is complemented with polished silver hinges and diamond-cut edges around the touchpad. It offers up to 8 hours of battery life. As strong on the inside as it is on the outside, the Spin 7 offers uncompromised performance with a 7th Generation Intel® Core™ i7 processor, up to 8GB of memory and a speedy 256GB SSD. Dual USB 3.1 Type-C ports are included for quick data transfers, connection to an external display, and to charge the notebook. A wide glass touchpad helps fingers glide smoothly across the surface with minimal friction. The Spin 5 features Acer’s proprietary wobble-free 360 degree dual-torque hinge, which makes it easy to open but prevents it from toppling over when using the touchscreen. The crossed-hairline brush finish on the aluminum top cover provides a fabric-like appearance, making the Spin 5 easy to grip while also preventing the accumulation of messy fingerprints and smudges. Spin 5 is powered by up to 7th Generation Intel Core processors for incredible performance, up to 16GB of fast DDR4 memory and up to 512GB of SSD storage for fast boot up and data transfer. The Spin 5 delivers up to 10 hours3 of battery life for all-day productivity, and the bright 13.3-inch Full HD IPS touchscreen display can be used with an optional Acer Active Pen with Windows Ink. An HD webcam with HDR (High Dynamic Range) imaging support provides clear, bright and detailed images. The Spin 3 features a 15.6-inch HD or Full HD IPS display and comes with a sporty brushed-hairline finish. Solid performance is delivered with 6th Generation Intel Core processors and up to 12GB of fast DDR4 memory. It also features dual storage support, and comes with both solid state drives (up to 256GB) and hard drives (up to 1TB), providing fast boot up times and ample storage for documents and media. A backlit ergonomic keyboard with a 1.6 mm keystroke provides for comfortable typing. It also includes an HD webcam with HDR imaging and delivers all-day productivity with up to 9.5 hours3 of battery life. With ultra-affordable prices and up to 9 hours3 of battery life, the Spin 1 is ideal for students or for use as a second computer. The Spin 3 comes in models with 13-inch or 11.6-inch Full HD IPS displays, and include configurations with all new Intel® Pentium® or Celeron® processors. Designed with the classroom in mind, the Spin 1 (SP111-31) supports an Acer Active Pen with Windows Ink, and features a display that’s covered with Antimicrobial Corning® Gorilla® Glass, made possible by embedded antimicrobial ionic silver that lasts the lifetime of the touch surface. To learn more about availability, product specifications and prices in specific markets, please contact your nearest Acer office via www.acer.com. The Spin series was unveiled today at the next@acer press event at IFA in Germany, where the company announced a range of new devices and solutions for families, students and professionals. For more information, visit acer.com/nextatacer.